As more and more people are beginning to find out, Lisbon has one of the most vibrant bar scenes in the whole of Europe and is a popular all-year round destination. From historic whole-in-the-wall Ginjinha shops and pretty kiosks, to modern cocktail bars, G&T palaces, and rooftop bars, there's something for everybody. What surprises most people when visiting Lisbon is how vibrant the streets can be at night time, with many people gathered outside bars until early in the morning, but not necessarily drinking. Most bars close at 02:00, some not opening until after 18:00. When in Lisbon, you should obviously try the famous Ginjinha sour cherry liqueur, normally drank as a shot from the many kiosks (the locals seem to drink it on their way to work, at lunchtime, and on their way home). There's a great selection of Portuguese gins and local beers, whilst the famous vinho verde "green wine" (young grapes) are a must try. Beers vary in size, with most people in Lisbon ordering an "imperial" (20cl) or "lambreta" (15cl). The more standard size in most European cities (50cl) is called "caneca", whilst a bottle is called a "cerveja", or a "mini", for the popular 25 cl size. "Saúde" is Portuguese for "Cheers"
This historic bar in Praça de São Domingos is a must-visit for any visitor to Lisbon. In 1840, it became the first place in the city to sell the local liqueur, Ginjinha (or Ginja), when Galician immigrant Francisco Espinheira, whose portrait proudly stands above the bar, was advised by a friar to infuse ginja berries (Morello sour cherries) in Aguardente (a seriously strong Portuguese brandy), adding sugar, water and cinnamon. Today, there's dozens of tiny Ginjinha bars around Lisbon, each with barely room for two or three customers, serving the drink as a shot with or without ("com" or "sem") a cherry in the bottom of the glass. This tiny bar is obviously the first choice of tourists however it still attracts plenty of locals, who seem unable to pass by without calling in for a shot. Closes at 22:00. Translated into English as "Chinese Pavilion", this quirky bar is housed in a former grocery store of the early 1900's. It's like drinking in a museum, with the decor entirely filled with antiques dating as far back as the 1700's. A pool room, pure teas and over 100 cocktails together with incredible service from staff wearing handmade traditional clothing, make this a must-visit when in Lisbon. When we compile our list of the best bars in each city, we primarily look for bars which are so unique, you will not find them elsewhere. This circus, performing arts centre, bar and restaurant fits that remit perfectly. Not only does it offer one of the best sunset views in Lisbon, but you have the chance to drink under a circus tent, or from a fortune teller selling "love potions" of delicious home made chocolate liquor. On the approach to the Castelo de Sao Jorge castle, it is a very romantic place to catch a show or a sunset. The restaurant, where you can visit just for drinks, is up a narrow spiral staircase whilst the Bartô basement bar opens later in the evening, offering live jazz music, movies, theatre performances and dance, alongside comedy. debates and book launches. What started off as a Facebook group for lovers of gin, grew in to a shop and, finally, a few doors along the same road, in November 2015, realised a dream by opening an amazing bar, restaurant and store 100% dedicated to gin. Located in an old embassy, set in a former palace belonging to the crown prince, and offering over 60 gins, cocktails, great food and a party hosted by a different gin brand each month, this is one of the most stunning environments in which you will ever sip a glass of the juniper stuff. Fittingly placed at number 5 is "Five Lounge", the sophisticated and cool, multi award-winning Lisbon cocktail bar from Michelin Star restaurant-trained English barman Dave Palethorpe. Providing a combination of gorgeously presented classics with beautiful inventive cocktails, made using only premium spirits and fresh fruits, it is an unpretentious place to relax over some of the best cocktails in Portugal. The decor is stylish, the service is slick and the ambience is inviting, with the music played at a level you can enjoy the conversation, which usually revolves around the high quality of your drink. It's also home to Diageo Reserve World Class Portugal Bartender of the Year 2015, José Maria "Ze" Robertson. Opened in November 2015 on the ground floor of the 9Hotel Mercy, a short walk from Largo de Camões, this cocktail bar is inspired by the Portuguese relationship with tea - Portuguese merchants first brought it to Europe from China in the 16th Century, and Catherine of Braganza, the wife of Charles II of England, actually introduced it to Britain in 1662. With an onus on 18 (double nine) beautifully presented tea infused signature cocktails, the quality stands out in a city where high end mixology is a relatively new introduction. We'd go as far as saying that they serve the best drinks we have tasted in Lisbon. The house cocktail, "Double 9" was so good, we returned three nights in a row to try it. This magical bar, set in an old warehouse overlooking the Tagas River in the trendy Cais do Sodré district, boasts over 1000 Portuguese wines, some available by the glass, and almost 100 gins. There's a selection of cocktails, which include homemade wine barrel aged infusions, which can be enjoyed on the riverside deck or in the stunning maritime designed bar. Boasting a library full of antiquarian books, which drinkers are welcome to read, some of them are very rare and are related to the concept of space, the history of Lisbon, Portugal and other Portuguese speaking countries, art, architecture and poetry. Every month there is exhibitions, promoting young painters or photographers, whilst the multipurpose space doubles up for design exhibitions, concerts, DJ sets and film screenings. Closed Sundays and Mondays. The first flagship bar of the exclusive José Maria da Fonseca wine company in Lisbon is located in the historic neighbourhood of Chiado. All of the wines from the oldest wine house in Portugal are available by the glass, including their popular Periquita and Lancer labels, alongside a range of local food delicacies. 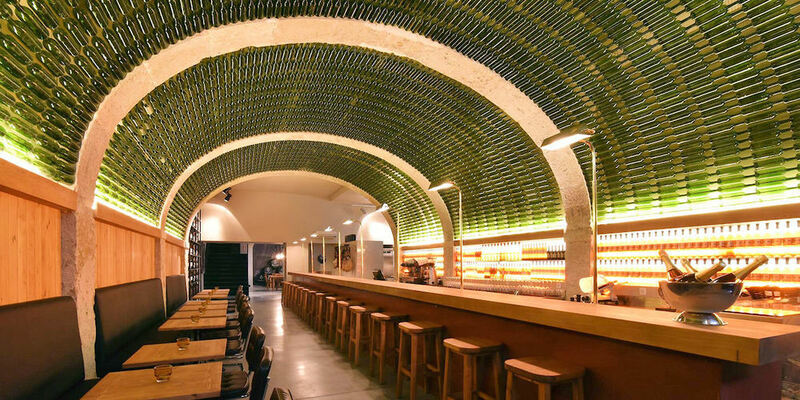 Underneath an impressive ceiling of wine bottles, the venue also hosts several launches of new wines, tastings and wine courses open to the public. Open every day until midnight. 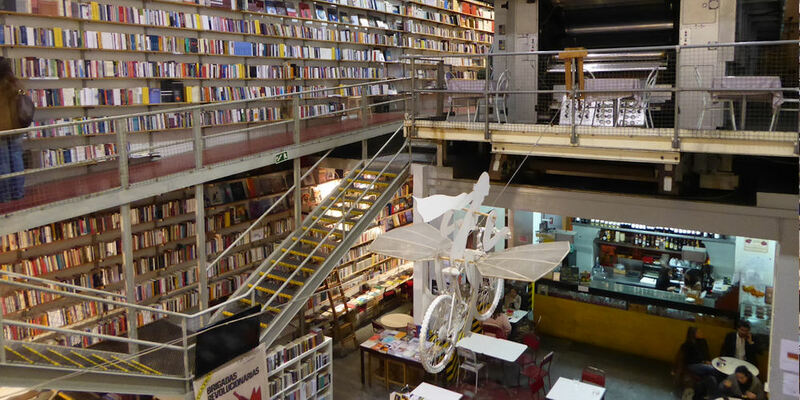 This incredible bookstore and cafe bar is the highlight of the LX Factory creative space, located underneath the Ponte 25 de Abril bridge in a gigantic former fabrics factory in the Alcântara district of Lisbon. Two huge floors of the former industrial building, which dates back to 1846, are filled with second hand books and the original factory machines, amongst which you can drink from the bar that is the centrepiece of the room. Theatre productions, book readings, live music and other performances make up a busy nightly schedule with a Sunday vintage market proving extremely popular too. The whole area is worth visiting and you can make a night of it with the five former factory buildings housing over 20 bars and restaurants as well as companies related to fashion, publicity, communication, fine arts, architecture, and music. Hidden behind a small door and up some stairs near the Rossio square, inside the Palacio Alverca, this incredible building will simply take you by surprise the moment you enter the Moorish courtyard. The stunning 17th Century palace should be high on your list of places to visit even if you don't stop for a drink in the ground floor Taberna with its two courtyards, or climb the elaborate staircase to the first floor restaurant, which you can also visit just for drinks. The palace is home to a culture centre dedicated to the Alentejo region, where cork comes from, and is popular with the old locals who come to dance in the beautifully grand ball rooms. The traditional Portuguese restaurant is set in an ornate blue tiled hall with large crystal chandeliers and offers an impressive regional wine list. No visit to Lisbon is complete without visiting a Fado club, a restaurant or bar offering traditional Portuguese folk music shows and local cuisine. This historic venue from Fado star Mário Pacheco, with its vaulted cellar setting and stone arches, just a stone's throw from the Sé de Lisboa cathedral, is perhaps your best choice to get a feel for the scene. The most famous fadistas and guitarists, like Joana Amendoeira, Miguel Capucho, José Fontes Rocha, Cuca Roseta and Ana Maria Bobone, have performed here in front of guests which have included the likes of Cristiano Ronaldo, Woody Allen, Eusébio, Richard Branson, Neil Armstrong, Cliff Richard, Nuno Bettencourt, Zucchero, and The Scorpions. If you're not interested in dining, you can still visit for just drinks and a show. If you're interested in the scene, the Museu do Fado is just around the corner, which also plays host to some big concerts from the genre. Not to be mistaken with the Restaurante Alfaia, on the corner of the street, this friendly wine cellar offers only wines from Portugal. The impressive wine list is changed every 15 days, giving you plenty of reason to revisit. Various regions of the country are represented, many available by the glass, and there's also a great variety of Ports, Madeiras, Muscatel, spirits and Portuguese liqueurs. To match the wine, typical flavours of the national cuisine are on offer, with snacks including bread, creamy cheeses, regional sausages, and hams, alongside cooked dishes, such as black pudding rice, sausage with scrambled eggs or black pig in olive oil. They even have their own hoppy real ale. Located in a former 18th Century building in Lisbon's old Red Light District, this popular bar pays tribute to its former use as a cheap guesthouse, which rented rooms by the hour to prostitutes and the sailors who used their services. Decorated with plenty of saucy objects, the walls are lined with burlesque posters and mirrors, with various rooms amongst the five floors representing the old boudoir, including an erotica book store and a pole dancing room, with lessons available for those wanting to learn the art. It gets busy after midnight, even on Sundays and Mondays. A must-visit when in Lisbon and the perfect place to get a feel for the city's gastronomic offering. Open from 10:00 every day until midnight (Sunday - Wednesday) and 02:00 (Thursday - Saturday), this has been the city's main food market since 1892. Since 2014 it has become even more popular, thanks to a tie up with Time Out magazine giving it a modern, more cool look and featuring over thirty hand-picked stalls from some of the best restaurants and bars in Lisbon, alongside some of the finest food and drink producers, each selling the best Portuguese produce. The atmosphere is great, especially as it gets busier and the 500 seats indoors, and 250 outside on the terrace, start to fill up. Dating back to 1867, the small Art Nouveau quiosques (kiosks) that are dotted around Lisbon's squares, gardens and water front have remained an important part of Portugese life. Originally opened as small shops selling flowers, tobacco, newspapers, lottery tickets and refreshments, they became an important meeting point with the Quiosque Rei dos Torresmos in Cais do Sodré even selling fried fish and olives. The stalls became so popular as a place to meet and chat, that it was only a matter of time before they started selling ice cream, lemonades, hot chocolate, wine by the glass and even bottles of beer, with seating provided on their surrounding esplanada. Sadly they later fell out of fashion, being neglected and left to rust until the city council stepped in to repair them in 1987. It wasn't until twenty two years later, in 2009, that the spirit of the "kioskos" returned when the owner of vintage shop A Vida Portuguesa, Catarina Portas, and architect John Regal, opened "Quiosque De Refresco", restoring the old kiosk in Praça Luis de Camões, next to the statue of the 16th Century poet, and offering the traditional drinks of lemonade, blackcurrant, milk, hot chocolate, iced tea, mazagrã (cold coffee) horchata (almond drink) and capilé (fern syrup), alongside wine, Porto, Ginjinha and cider. It was so successful that a year later, they opened the beautiful pink quiosque in the romantic gardens at Praça Principe Real (below), and the smallest of Lisbon's quiosques in the gardens at Praça das Flores. In 2013, the stunning red quiosque in Praça de São Paulo was added to the collection, followed shortly after, in 2014, by the bright yellow quiosque in front of the cathedral at Largo Da Sé (below). Thanks to Catarina Portas and John Regal, this historic part of Portuguese culture looks set to stay. 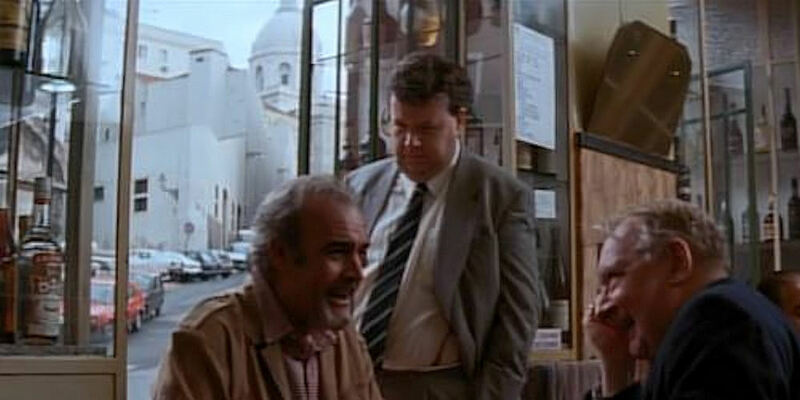 The five, together, make a great historical Lisbon bar crawl. Without wanting to use up the whole list of best bars in Lisbon with the small Art Nouveau 1860's quiosques (kiosks) which are dotted around Lisbon's squares, gardens and water front, we just have to include Catarina Portas and John Regal's bright yellow "Quiosque De Refresco" for its romantic location in front of the cathedral and yellow tram stop at Largo Da Sé. Opened in 2014, it offers the traditional drinks of lemonade, bica, milk, hot chocolate and iced teas alongside wine, Porto, Ginjinha, Licor Beirão, Amendoa Amarga (almond liquor), Grogue and cider. This historic bar is located in a former antique shop which converted to a bar on the 27th April 1974, just two days after the 25th April Revolução dos Cravos. Named "The Parody" in honour of the satirical magazine by Raphael Bordallo Pinheiro, the atmosphere was politically charged as Republicans mixed with those from the revolutionary left. Today, it's mainly the cocktails that are mixed, rather than political opponents, with over fifty on offer. The velvet walls and Art Deco furnishings take you back to days gone by and leave a hint of the building's former use. This Lisbon institution celebrated its 50th Anniversary in 2014 and is still owned by the friendly Albina Oliveira brothers who will greet you when you enter, having to press the doorbell on the green door at 178 Rua do Século in Bairro Alto. Smoky inside and popular with politicians and journalists, it is decorated like an old English gentleman's club and is said to serve the best steaks in town. The famous Grandfather clock in the corner has no hands, so you will find that time passes by as you enjoy the many liquors on offer. Open every day of the year, with the exception of December 24th, from 16:00 - 03:00. Not actually a bar but a must-visit when in Lisbon. Since 1837, this patisserie next to the Mosteiro dos Jerónimos monastry, has been serving Pastéis de Belém, a cinnamon topped, golden crust pastry filled with custard cream, baked at 200°C to a secret recipe. Ideal to drink with a Port wine, this is one place to visit if you have a sweet tooth. Popular with tourists and locals alike, it is open every day until 23:00 (or midnight in summer). Located in the beautiful Museu da Farmácia pharmacy museum, this stunning restaurant, cocktail bar and lawn terrace with views of the Tagus River and the 25 April bridge, is decorated with vintage medical memorabilia and the drinks, named after various drugs, are served in medicine bottles, vials and measuring jugs. Even the menu is printed on an old pharmacy notebook. Whilst primarily a restaurant, it is still possible to visit just for drinks. Closed on Mondays. The first museum of beer in Portugal was founded in Lisbon to celebrate the best beers of the Portuguese speaking countries, including Angola, Brazil, Mozambique, Cape Verde and São Tomé & Príncipe. As well as the first floor museum, there is the Beer House, a bar and restaurant famous for its codfish cake, produced by a machine in the middle of the room. With over 240 seats inside, including bar stools, and a large terrace directly on Praça Do Comercio, with 380 further seats offering a wonderful sight to the river, it is a great place to enjoy the 35 or so Portuguese artisanal and mainstream beers, six of which are brewed on site. This popular wine bar is located in a former chemist dispensary in Bairro Alto and has retained the vintage look with many original fittings, including the old pharmacy cabinets, which now hold over 200 bottles of a different kind of medicine and are backlit by changing coloured lights. Most of Portugal's wine regions are represented, with some top name bottles available, many also sold by the glass. You may surprised to learn that the owners are actually two brothers from India, which may help explain the tea room in the back decorated with Indian ornaments. This artisan real ale bar celebrates the values, ideas, concepts and the real names and faces behind the 100 or so fresh handmade craft beers on its menu, many from Portugal, including Arrábida, Bolina, Damn, Eighth Hill, Letter, Lx Anne, Mastic, Mean Sardine, Passarola, and Two Ravens, proving that there's more to the Lisbon beer scene than just Super Bock and Sagres. With regular tasting nights and beer launches, this is the ale lovers place to visit when in Lisbon. This popular bar and restaurant in the Swiss Ambassador's former residence, sits at the top of the famous yellow Elevador da Glória funicular. It is one of the busiest venues in town, largely for its fantastic offering of Portuguese produce but also because it is attached to The Independente hostel. The wine list is entirely Portuguese, with grapes from various regions, whilst head mixologist Alexandre Leitão has created a cocktail list that showcases the different national flavours, from north to south. The result: a menu with 100% Portuguese cocktails. From the same people behind The Decadente (above) and accessed by a beautiful elevator, the oldest in Lisbon, "The Unusual" cocktail bar offers an amazing view over the city from its terrace in front of the Mirador de São Pedro de Alcântara. Mixologist Alexandre "Hector" Leitão has put together a menu of signature and classic cocktails, some centuries old, with various elements of unheard-of forms. Sommelier Henrique Costa Pereira, has compiled a wine list of 50 different bottles telling the history of Portuguese wine, from north to south, and to the islands. Located in a former 18th Century coach house, this extremely popular wine bar and small hostel boasts nearly 1000 different wines, mainly from Portugal, with every region represented. As well as the wine, it also wins rave reviews for its Pesticos (Portuguese tapas). Cocktails, beers and spirits sit on the impressive menu alongside the choice of reds, whites, 25 greens, vintage Ports and Madeiras, which are opened and decanted at your table with heated Port tongues and ice. This hipster hangout by the river, on the edge of town, is spread over two floors of an old railway worker's social club. The focus is to recreate the atmosphere of the social club with a program of music concerts, theme parties, outdoor cinema, theatre shows, art displays and book launches. With three distinct spaces in which to do this, the TGV Room and the Club Room downstairs - a huge ballroom playing host to live bands and DJs - and the Terrace, a massive sun deck, decorated with leather train seat0s, overlooking the passing ships with DJs adding to the atmosphere. The bar is open until 4am, with many people then going on to superclub Lux (below), which is also in the area. Overlooking the Sé de Lisboa cathedral, you will find this friendly jazz cafe, offering sandwiches and cakes alongside cocktails, local wines, teas, coffees and a nice choice of Portuguese and European beers. The retro decor and cheap drinks attract a more Bohemian crowd, with room for barely more than 20 people inside. The venue is famed for the "worst chocolate cake in the world" - so good that one slice is never enough. With so many rooftop bars in Lisbon to choose from, it's hard knowing which one to visit for sunset if you're only in town for a few days. Located on the 7th floor of Hotel do Chiado, this panoramic cocktail bar is one of the best, with a large welcoming terrace, two gardens and sun loungers overlooking the castle and the river, with a close up of the Elevador de Santa Justa next door. Founded in 1829, this historic pastry shop boasts one of the oldest tea rooms in Lisbon, upstairs. Ornate murals, cream-coloured walls, detailed woodwork with touches of gold and a mirrored ceiling transport you back in time, providing the perfect surroundings to enjoy wine, cake and coffee. Still owned by the same family as its founder, Baltazar Castanheiro, only two people in the entire company know the secret recipe for its famous "Bolo-Rei" (King’s Cake), a bread-like Christmas cake with raisins, fruits and nuts. Their wonderful "Pastéis de Nata" custard tarts - the same as those invented at Pastéis de Belém (below) - are popular all year round. 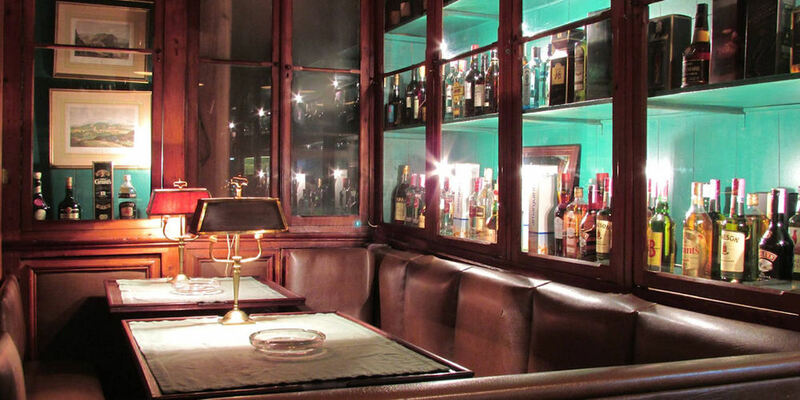 This excellent cocktail bar, located inside a beautiful 18th Century building, combines the elegance and prestige of the Marquis de Pombal era with modern touches. Inside the three rooms, you will find soft lighting reflected by glamorous framed mirrors, a saxophone on display at the entrance matched by the quiet jazz and soul music, traditional wooden floors and the original stone walls and exquisite tiles, comfortable Louis XIV-style velvet armchairs, 16 premium gins and some of the best cocktails in town. Try the 10 cocktail tasting flight. This welcome addition to the Lisbon cocktail scene, opened in early 2014, bringing a 1920's Prohibition era vibe to the Portuguese capital. Ring the doorbell at number 5A, Rua do Salitre, next to the Avenida station, and enter a world of top class cocktails. Closed Sundays. This wonderful tiny cafe bar really is, as its name translates "a needle in a haystack". Opened in November 2015 and hidden away near the Museu De Fado, next to the Museu Militar and Santa Apolónia station, it is only open from Thursdays to Sundays but is well worth visiting for the delicious food from Antonio Goncalves Guerreiro, the chef behind the amazing "worst chocolate cake in the world" at Cruzes Credo Café (above). The Portuguese liquor collection is worthy of note and we recommend trying a glass of one of these regional specialities. Oh, and yes, that really is Sean Connery in the photograph (in the movie "The Russia House", which was filmed here)..
Go to the Praça dos Restauradores, in the very centre of Lisbon, take the famous yellow Elevador da Glória funicular up to the top and drop in to this stylish bar inside the beautiful Palácio de Ludovice. Opened in 1946 and recently refurbished, keeping the exposed brick and 18th Century blue tiles from the original palace building, the result is a luxurious bar in which to enjoy a calm and relaxed atmosphere. Here, you can choose from a wide range of different Port Wines, the country's national drink, and more than 300 wines from the Douro region. Open until midnight. Closed Sundays. 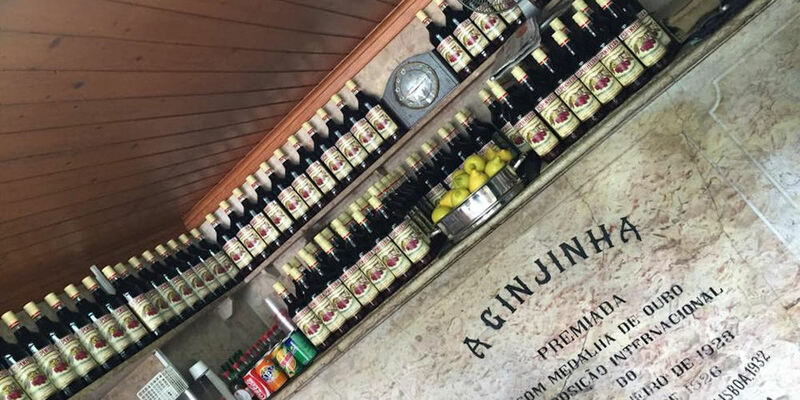 Translated as "Ginjinha Without Rival", this tiny 10m² hole-in-the-wall bar has been selling its version of the Portuguese cherry liqueur and Eduardino, a sweet aniseed liqueur, since 1890. Still owned by the family of Galician Licorista João Manuel Lourenço Cima, it seems to be more popular with locals than the other Ginja stalls around town, as the cherries here are said to be sweeter. As well as Ginjinha and Eduardino, you can find Porto, Aguardente (strong brandy), Bagaço (Marc) and Capilé (a syrup). Despite its history and the long queues of tourists, the bar has been threatened with demolition in 2015, following news that a Russian property developer has approval to build a new hotel on the spot which it stands. You will find over 150 outstanding Portuguese wines by the glass, including 10 from Lisbon, alongside rare old Port and Madeira wines, served with local cheeses and fine charcuterie in this friendly low-key rustic wine bar and shop on the tourist heavy backstreet near the entrance of the Castelo de Sao Jorge. With over ten Green Wines to choose from, we recommend the delicious Muros de Melgaco. Opens daily until 22:00. Possibly the most exclusive club in Lisbon, this rooftop bar of the city's tallest building, next to Largo de Camões, allows for an impressive 270º panoramic view of the city, within a sophisticated, modern and luxurious ambience. Open Tuesday - Saturday from 19:00, you can visit for cocktails or dine in their Japanese restaurant, but if you plan on arriving later to go clubbing, you will need to make a reservation. Over 21s only. Whilst not as ground breaking as the quiosque in Praça Luis de Camões (above), which was also opened by Catarina Portas and architect John Regal, one year earlier in 2009, this is arguably the most romantic of the small Art Nouveau kiosks, which date back to 1867, and are dotted around Lisbon's squares, gardens and water front. Painted in its original bright pink colour and located under the hundred year old cedar tree in the pretty gardens at Praça Principe Real, it sells the traditional drinks offered by the "kioskos" of the late 1800's, such as lemonade, blackcurrant, milk, hot chocolate, iced tea, mazagrã (cold coffee) horchata (almond drink) and capilé (fern syrup), alongside wine, Porto, Ginjinha and beer. Located outside of town, close to the airport, this popular tiny street corner bar in a residential neighbourhood is celebrated for its gin and tapas. With over 50 varieties of gin to choose from. with gin based cocktails too, it's not surprising to learn that many people make the short journey out of town to visit here. Boasting the country's largest choice of beers, with over 250 labels to choose from, including six on draft and 33 craft ales from Portugal alone, this friendly backstreet bar is the place to go for beer lovers. Opened in February 2015 with shabby-chic decor and a rock music soundtrack, it offers a smoking area and you can even try a beer flight (degustação). Whilst there are also spirits on offer and three basic cocktails (Caipirinha, Caipiroska and Black Russian), you won't find any wine. Closed Mondays. The "Association of Fools and Dreamers" is one of the liveliest bars in Lisbon and attracts an eclectic crowd thanks to its great atmosphere and extremely cheap drinks, each served with popcorn. Located in the party area of the Bairro Alto district, having recently moved from a smaller nearby venue, it has retained a Bohemian feel, if not the charm, with it shabby kitsch interior and random decoration, filling up very early with students, tourists, old and young. The third floor bar inside the Shiadu Hotel next to the Santa Catarina sightseeing point and the famous Bica funicular offers a great view over the river and 25 de Abril bridge. The small covered restaurant and bar opens up on to a cosy outdoor terrace with Portuguese petiscos complimenting the cocktails and local wines. One of the oldest and most beautiful cafes in Lisbon, dating back to 1905, it remains one of the most popular venues in town. Behind the gorgeous Art Deco front façade, you'll find a long narrow room with a black and white marble tiled floor, complementing brass fixtures, mirrors and red wood walls. Being close to the University, it was a favourite haunt of intellectuals and academics, including Portuguese poet Fernando Pessoa, whose statue now stands outside. Ironically, it is claimed, he preferred to take his strong “Bica” Brazilian coffee and his absinthe at the Café Martinho da Arcada (below) and not actually at Cafe A Brasileira - not that that fact puts off the tourists and students who flock here, competing for seats outside on the cobbled square. If you opt for a cup of Bica, instead of the basic selection of alcohol, do as the locals do and enjoy it whilst standing at the bar. A second branch, which opened across town in Braga in 1907, has also recently been renovated. The most famous club in Lisbon has been the place to party since 1998 and boasts a lavish decor as well as a rooftop terrace where you can watch the sunrise over the river until 6am, Thursday - Saturday. Located in a former harbour warehouse, international DJs spin electro but be warned, the door staff can be very choosy with who gets in and you should expect to queue after 3am. The entrance fee varies between €12 and €30. It's owned by actor John Malkovich and Marcel Reis, the guy behind the legendary but now sadly closed Bairro Alto club, Frágil, the same team behind top sushi restaurant Bica do Sapato, next door. Travel back to medieval Portugal with this popular theme bar that specialises in mead, ciders, local craft beers and unusual liquors like Medronho. Drinks are served in clay pot mugs and Viking horns, while plates of local cheeses and sausages make up the offering. The music mixes between Celtic folk music and traditional Portuguese, with occasional live concerts. Created in 1994 as a non-profit organization by a civic initiative, Galeria Zé dos Bois (ZDB) is an art centre located in a huge 18th Century palace in the heart of Lisbon's Bairro Alto district. It also plays host to some of the best live music in town, with the occasional foreign headline act. Away from the art and music, if you're looking to escape the crowded bars in the area, head up to the Nº49 bar on the third floor (Wednesday - Saturday from 10pm), past the art gallery on the first, or, if the weather is good, go straight up to the Terraço ZDB roof terrace, which is overlooked by the surrounding buildings. On hot Thursdays in July and August, the terrace becomes an outside cinema, with movies and documentaries projected on to the wall across the rooftops. Depending on what exhibitions or concerts are taking place, you may be asked to pay an entrance fee. Located in a former weapons factory on the docks outside of town, just 6 minutes train journey from Santa Apolónia, this fantastic cultural space offers fifteen different rooms for exhibitions and live music. There's a bar, disco, art gallery, cinema, restaurant, terrace, shops and a bookstore, which also plays host to jam sessions. Open Wednesday to Saturday, with a busy schedule, it's well worth making the trip out of town for some real Lisbon culture. We recommend buying tickets in advance to avoid disappointment. Named after one of Portugal’s most important artists of the 20th Century, this spacious piano lounge and cocktail bar in the lobby of the posh Four Seasons Hotel Ritz Libson, boasts many of his works, including a trilogy of huge handmade Centauros tapestries. Overlooking the Eduardo VII Park and St. George’s Castle, it's an ideal spot to meet for morning coffee, afternoon tea (16:00 - 18:00) or a more peaceful drink in the evening, away from the hustle and bustle of the more lively bars in the city. The most expensive bar in town. Translated as "the good, the bad, and the ugly", this cocktail bar and piano bar is split into five small rooms of a converted apartment above a shop. After the live music, DJs play jazz, funk, soul and indie rock until 04:00 at weekends. The cocktails are good quality and there's a big gins collection too. Closed Sundays. This cosy gay-friendly bar in the alternative hotspot of the Bairro Alto district, is especially popular with lesbians and hipsters. With its retro chic furniture and tiny dance floor, where you can move your body to the electronic music, you are guaranteed a good night in unpretentious yet trendy surroundings, with many theme nights and events organised. Closed Mondays. This gay-friendly wine bar on the corner of Rua da Barrocca and Rua das Salgadeiras in the heart of Bairro Alto, celebrates Portuguese culture with good regional wines, delicious local liquors and traditional food. The authentic floor and exposed rock walls add a rustic feel and there's even the occasional Fado night. All regions of Portugal are represented in this popular little wine bar, with over 40 varieties, from sparkling to Port and Madeira and, of course, reds, whites and the famous Portuguese greens, all available by the glass. To accompany the wine there is tasty traditional Portuguese meats, cheeses and other assorted tapas, including Enchidos, a sausage baked in Aguardente (brandy) and served in flames. The bright cocktail bar in the 5 Star Olissoppo Lapa Palace Hotel is one of the most beautiful retreats in the city, ideal for a business meeting and an informal drink on the terrace overlooking the Tagus River. For the afternoon, there's a tea menu offering a variety of 30 different types of tea selected from countries such as India, China, Vietnam and Japan. It has indoor and outdoor seating and is open 01:30 with live piano music Tuesday to Saturday evenings. During the day, this huge riverside venue, a taxi or short train ride out of town, acts as a (man-made) beach bar set around a swimming pool and sundeck. Then, around 23:00, the DJs pump up the pop and r'n'b to make it a popular stylish discoteca for a good-looking very young crowd, celebs and VIPs. Like the more tourist heavy Cafe A Brasileira next door (above), this beautifully ornate tea room is the perfect place to get a sense of a classic Lisbon tearoom. Built in 1765 as one of the formal showcase salons within Lisbon's Opera House, it became a pastelaria in 1868 and remains today where the locals go for the famous croissants, made to a secret recipe in a fire oven. Found inside the Restaurante Taberna Moderna, this tiny modern bar with room for only 10 people, primarily serves as a pre-dinner meeting point - although you can also take a table in the large restaurant. It offers over 100 varieties of gin, each accompanied by different herbs and spices, fruits or flowers. The gin based cocktails, with six signatures from house mixologist Magda Viegas, are impressive and there's also gin pairings for the restaurant's food menu. Located beneath the arches in the most beautiful square of Lisbon, Terreiro do Paço, this historic cafe dates back to 1782. Over the two centuries it has been open, generations of rulers, politicians, artists and writers have met here, most notably one of the greatest poets of the Portuguese language, Fernando Pessoa. His favourite table, where he enjoyed the excellent coffee and Aguardente (brandy), has been lovingly preserved and his image hangs proudly on the walls. Split into three areas, with a separate bar, restaurant and outside terrace underneath the arches, the food is authentic and there is a good choice of Portuguese wines. Closed Sunday. The modern, red and white themed wine bar in the Jerónimos 8 hotel, with its large balcony, serves rare Portuguese wines alongside Champagne and cocktails. This is the only bar in Lisbon where it is possible to taste the extraordinary Bussaco Wines, from the legendary garrafeira of the Bussaco Palace Hotel. Being located in the Belém area of the city, traditional Pastel de Belém tarts are amongst other dishes which complement the wine offering. You'll find this glamorous cocktail bar and restaurant on the top 27th floor of the Sheraton Hotel, the highest building in Lisbon, enjoying the best views over the entire city and the Tejo river. The finest Portuguese wines are displayed in a glass cabinet, with most also available by the glass and there's live music from the piano in the middle of the room. As you'd expect, service and cocktails are amongst the best in town and, like the view, the prices are also higher than elsewhere. Open until 02:00 Sunday - Wednesday, and 03:00 Thursday - Saturday, this should be one of the most memorable bars you'll visit in Lisbon, especially if you're there at sunset. Offering one of the best premium Gin Tonic menus in Lisbon, with over 80 brands to choose from, this plush restaurant and bar is set within the old cloisters of the Convento da Igreja dos Mártires. Located in one of the most upmarket areas of the city, it is a stylish affair, even boasting a 30-metre black glass jellyfish tank. Whilst the bar is primarily a waiting area Chef Miguel Castro e Silva's restaurant, you can still visit for cocktails (there's no menu, but they can make what you like), even if you struggle to get a table to dine.